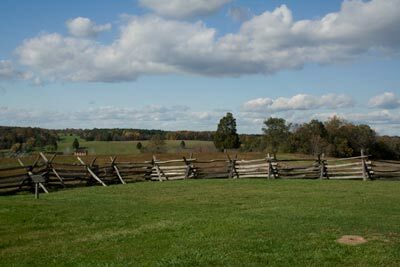 Bull Run (or Manassas as the Confederates called it) was the site of two major battles in the civil war. 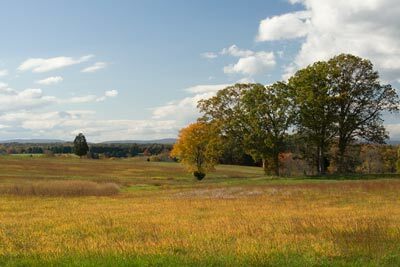 The first battle of Bull Run was the first significant land battle of the US Civil War. The leaders and citizens of the South and the North were sure that the war would be short. The period of enlistment for the Union army was 90 days. According to the excellent book General Lee's Army by Joseph T. Glatthaar, the men of the south were worried that the war would be over before they had a chance to fight. The fact that the Bull Run was the site of a second major battle about a year later showed how wrong they were. 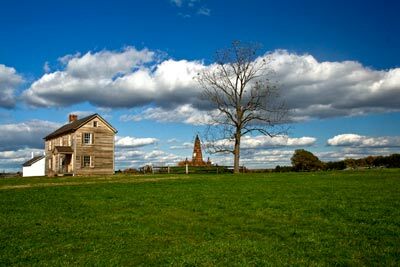 The National Park Service Manassas website provides a good overview of the two battles. Civil War Harper's Weekly, August 17, 1861 website provides a Union view of the first battle. 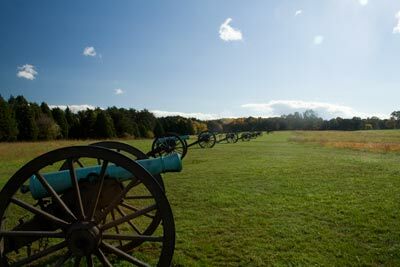 Until I visited the battlefield, I did not realize how big an area was covered by the fighting. When you read about the battle and look at the maps, you don't get a feel for the distances involved. Nor do you get a feel for the terrain. Because the battle was fought on farmland, everything is still pretty much the way it was then. As the photos show, this is open rolling country. 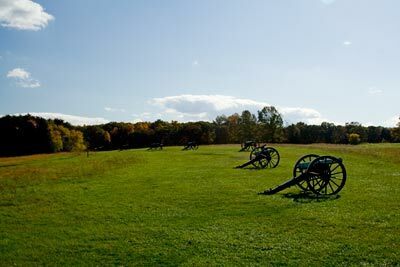 Soldiers had to charge across open fields, usually uphill, under fire from small arms and artillery. Union sharpshooters used the Henry farmhouse for cover to attack a confederate artillery battery.. 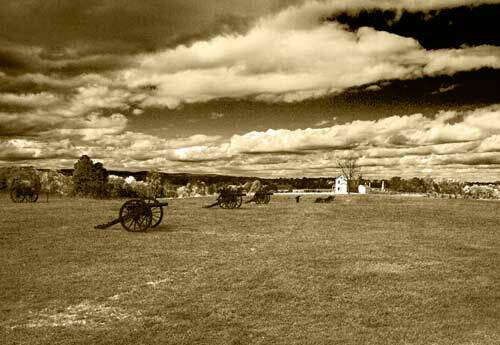 The artillery battery returned fire and forced the sharpshooters out of their position. The grave in the photo is of an old lady who was killed by the confederate artillery. The Confederates outnumbered the Union during first Bull Run or first Manassas ( General Lee's Army ) although many accounts suggest otherwise. 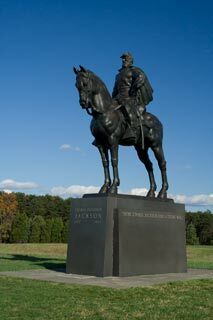 Stonewall Jackson got his nickname and began to establish himself as a combat leader at Bull Run. Confederate general Barnard Bee, while rallying his troops who were in danger of being overrun, decided to use Jackson's brigade, which had just arrived on the battlefield, as an anchor. Bee is quoted as saying "There stands Jackson like a stone wall! Rally behind the Virginians!" With a little bit of luck First Manassas or First Bull Run would have been a Union victory. But that was not to be. Jackson's brigade held, Confederate reinforcements arrived while Union reserves didn't. And the possible victory turned into a rout. Some Union soldiers didn't stop running until the reached Washington, DC. 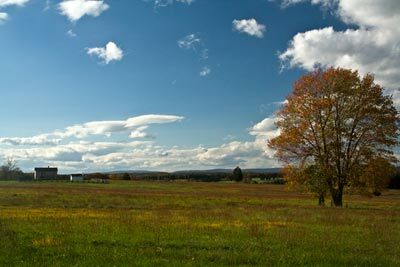 One interesting fact about Bull Run is that much of the fighting took place on a Mr. McLean's farm. 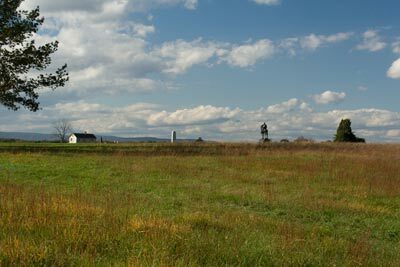 McLean sold his farm and moved to the village of Appomattox Court House to be as far away from the war as possible. Little did he realize that he would host the meeting that effectively ended the war. The Confederates were too exhausted to follow up the victory on the field. As often was the case in many Civil War battles. Soon after the battle, the hearings began to discover who was at fault. On the Union side the hearings looked for someone to blame for the loss. On the Confederate side, the hearings looks for someone to blame for not following up the victory and capturing Washington. In the final analysis it seems that soldiers on both sides fought bravely. But the Confederate forces were better led. It appears that many of the best officers that fought in the US Army during the Mexican War, were from the south and choose to go with their states when the state joined the Confederate States of America. I've always wondered, what did the non-commissioned officers and grunt soldiers do? The US army was over 100,000 strong during the Mexican War. Some of these soldiers would have been senior non-coms by the time the Civil War began. They would have provided crucial leadership during the early phases of the war. Yet I can't recall seeing any discussion of them in any Civil War history. Maybe this is a thesis topic for some history major. The victors camped on the battlefield where they had to put up with the groans of the wounded still on the battlefield, the stench of the dead, and the hardship of camping out. They had the task of recovering the wounded, both Confederate and Union. And they had to bury the approximately 1,000 dead men and unnumbered horses. The Union soldiers, on the other hand, were able to sleep in more comfortable quarters. Second Manassas was a long several days fight that ended in another Confederate victory. But it did not end it a rout as did the first battle. And both armies lived to fight another day.